»Have You Ever Been To Sri Krishna Matha In Udupi? 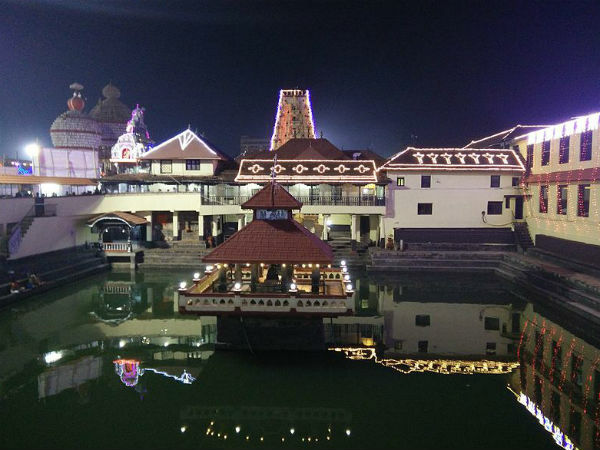 Have You Ever Been To Sri Krishna Matha In Udupi? Karnataka is one of the few states in India which have everything under their arms to satisfy the wanderlust of its visitors. From beaches to lakes, hills to mountains and forts to temples, it hosts innumerable places which might leave you wondering about its greatness. Located in the coastal region of Karnataka, Udupi is one such place which is a definite destination for travellers of all kind, as they can find everything around it, from hills to beaches and temples to forts. However, have you ever heard of Sri Krishna Matha in Udupi? If not, then you must plan a trip to this religious site in Udupi which is considered as one of the significant pilgrimage sites in Karnataka. Read on to know more about its speciality, location and its nearby places of interest. Located in the coastal region of Karnataka, Udupi experiences a hot and humid climate during the summer season and hence, it is least visited during the months of May and June. However, for nature lovers, photographers and Hindu devotees, Udupi remains a year-round destination. If you are planning to explore the beauty of Sri Krishna Matha comfortably, the best time to visit Udupi is from August to March. Sri Krishna Matha is one of the most popular Hindu temples in Karnataka and is situated in the city of Udupi. It is said to have been formed by Madhvacharya, a Hindu philosopher and the founder of Dvaita school, in the 13th century when he found an idol of Lord Krishna in a large block of gopichandana. Since then, it has been a major religious site and a pilgrimage destination for Hindus, especially the followers of Madhvacharya, who is also known for founding the Ashta Mathas of Udupi, i.e, the eight monasteries. These eight institutes are known for preaching on Hindu philosophies as per Dvaita schools. The religious customs and traditions of Sri Krishna Matha are controlled by these eight schools of Dvaita. Sri Krishna Matha is a worshipping site as well as a meditation centre. Hence, it is a perfect place for every traveller who is keen on learning about the profound knowledge of Hindu philosophy. The major speciality of Sri Krishna Matha lies in its divine atmosphere and composed environment. Once you are within the boundaries of Sri Krishna Matha, you will certainly be lost in a world of seclusion. Being a great place to get enlightened, people from all over the state come here to learn about the different aspects of life. Apart from its beautiful setting, it is also known as the place where Dasa Sahitya, a form of Indian literature, was originated. The major thing which distinguishes it from other Hindu temples is that you need to use the silver-plated window, which has nine holes, for worshipping the lord. If you are looking forward to catching a glimpse of Lord Krishna, then you need to view past the inner window and outer window, which are known as Navagraha Kindi and Kanakana Kindi respectively. Isn't it an interesting place? Apart from enlightening yourself on the different subjects of life and learning about the perspectives on philosophical thoughts, you can also explore its surroundings and visit nearby tourist places, such as Anantheshwara Temple, which is said to have been constructed a thousand years ago, and the Ashta Mathas of Dvaita Hindu philosophy. If you desire to explore beyond the boundaries of Udupi city, then you can also visit Kapu Beach, St Mary's Island, Malpe Beach and Kudlu Falls. By Air: There are no direct flights available to Udupi and hence, you need to take a flight to Mangalore Airport and then from there you can either hire a cab or catch a bus to Udupi. Sri Krishna Matha is located at a distance of about 3 km from the city centre. By Rail: Udupi is one of the major towns in Karnataka and hence, it is well connected to all other cities and prominent towns by rail. You can catch a direct train to Udupi railway station. By Road: Udupi is connected to Bangalore and other cities with a good network of roads and hence, it is easily accessible by road.